General Hospital Spoilers, Friday, February 10th: Hayden to the Hospital’s Rescue–Stat! Tracy’s intends to save GH–hopefully with a little help from Hayden in the “General Hospital” spoilers. 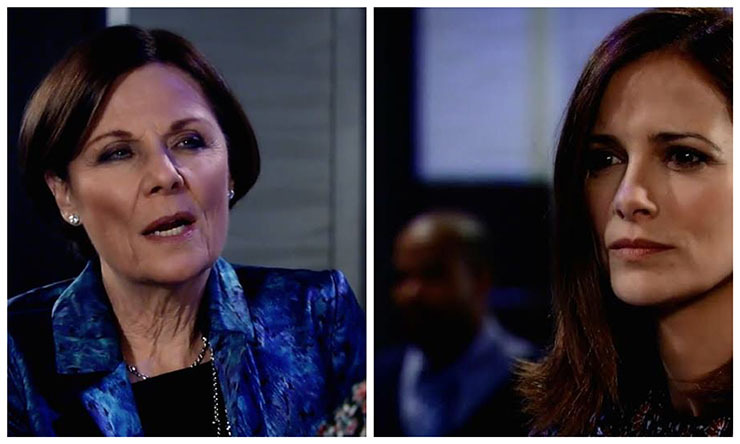 “General Hospital” spoilers for Friday, February 10th, reveal that Tracy has her hands full. It’s a good thing that’s never stopped her from getting what she wants! Now that Hayden (Rebecca Budig) is all better health-wise, people are coming at her from all directions to save GH from financial ruin. Tracy (Jane Elliott), meanwhile, is set on saving the Port Charles institution from going under. Friday she makes a demand of Hayden. Well, no one said coming back to life from the brink of death meant things would always be carefree for Hayden. Tracy cares for Hayden, clearly, but she also cares for her hometown and the hospital. There are so very many pieces to the puzzle of Morgan’s death. We know what some of them are, those who want to solve the puzzle now fewer, and there are probably a couple zingers none of knows yet. This is daytime drama we’re talking about! Friday Jason (Billy Miller) has some finger-pointing to do, as the complications arising from the inquiry into Morgan’s passing reach a boiling point. Jason’s wife, ready to pop any day now, gets some friendly overtures from a supposed friend. Maybe Sam (Kelly Monaco) should have gone to the safe house after all! Andre (Anthony Montgomery) confronts Jordan (Vinessa Antoine) in regards to their tumultuous relationship. The Chief of Police is not easy to fluster, but even she may not be ready for her boyfriend’s hurting heart and resulting demands. At The Floating Rob, the nurses have a powwow. Epiphany (Sonya Eddy) gets them riled up, ready for the fight of their lives.